Listen to Frankie Miller singing "It took a lot of love"
Frankie Miller was born on the 17th December 1931 in Victoria, Texas. He formed his own country band while he went to college and was soon making regular Saturday afternoon appearances on a local radio station in Victoria. His career progressed when he was featured on Hank Locklin´s show in Houston. In 1952 his career was temporarily intrerruped when he was drafted into the US army for two years. After basic training in California he was sent to the front line in Korea where he attained the rank of sergeant and was awarded the bronze star. During his military service he managed to compose some 40 songs. Back in Texas again he was lucky to be signed to one of the major labels, Columbia. On the 27th July 1954 he entered Jim Beck´s studios in Dallas, Texas, and recorded four tracks. "Hey! where ya goin?" and "It´s no big thing to me" formed his first release on Columbia but it didn´t sell particularly well. He recorded a total of 12 songs for Columbia but none of them sold that well and after five releases Columbia dropped him. Despite the lack of chart success Frankie continued to make personal appearances and was a regular on the Cowtown Hoedown radio show in Fort Worth. In 1957 he had a single release on the Cowtown Hoedown label. Miller then signed a recording deal with Manco, which resulted in one release. Then he signed with Starday and recorded the single "Blackland farmer/True blue" (Starday 424). The record entered Billboard´s Country Charts on the 13th of April 1959 and finally reached #5 and became Miller´s biggest seller. 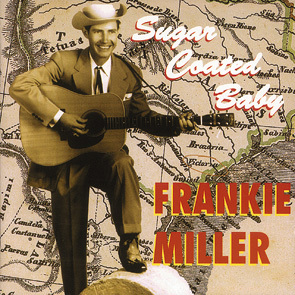 Frankie Miller was voted most promising New country Artist for 1960 by Cash Box Magazine. The follow up single "Family man" reached #7. Only two more releases managed to reach the charts, "Baby rocked her dolly" (1960) and "A little south of Memphis (1964). In the early sixties, Frankie, who was living in Arlington, Texas, was a member of the cast of the "Louisiana Hayride" in Shreveport, Louisiana and made several guest appearences on Grand Ole Opry in Nashville. He also toured with Pee Wee King, Ferlin Husky and Johnny Cash. He was also a regular on the Big D Jamboree in Dallas. Frankie moved to Nashville but by 1965 he lost interest for the music buiness and moved back to Texas. He started to work with cars. However, he recorded a single for Stop records in 1968 and and also recorded four songs under the direction of Dave Kirby and Hal Bynum in Pete Drake´s studio in 1979. Those recordings were not released. Then 1999 he suddenly started to appear again and surprised everyone with a cd on Cowboy Capital Records (The Comback). Bear Family BFX 15082-Hey! where ya goin´?